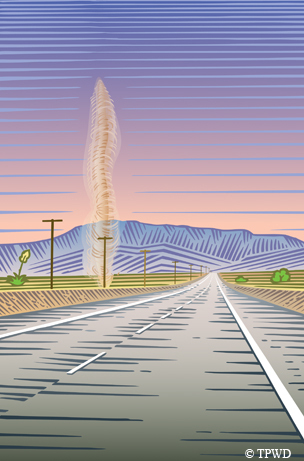 ﻿﻿﻿﻿﻿﻿﻿Folklore and science help unravel the mysteries of dust devils. ﻿﻿﻿﻿﻿﻿﻿﻿First there was one. Then a pair. Then a trio of Chihuahuan Desert diablos — whirling dervishes of what looked like columns of smoke, twisting crazily across the despoblado between the blacktop and the Davis Mountains. On this mostly isolated stretch of U.S. Highway 90, the dust devils provided the only entertainment outside my window. But it was enough. The thermometer in my car that sizzling afternoon read 103 degrees as I sped through the sere stretches of West Texas toward the tiny burg of Valen­tine. It was the penultimate leg of a more than 1,300-mile summer journey through southeastern New Mexico and West Texas on the way back to the Hill Country. Mother Nature’s ghostly mini-twisters seemed suddenly to materialize in the distance, rising in a single column before collapsing and dissipating, returning powdery dust and rock particles to the desert floor. One dust devil, however, seemed to pick up steam as I approached, rising some 30 feet straight up into the air like a mini-tornado, finally spinning out its ephemeral life in the span of several minutes. The display got me wondering about this strange natural phenomenon. Just what caused these dryland twisters and how prevalent are they in Texas? Information and statistics about the Lone Star State’s little devils aren’t easy to come by. There’s no shortage of tall tales about the phenomenon, however, and nicknames abound throughout the world. Sports teams and music groups have appropriated the term. The Cosmic Dust Devils is both the name of a Texas indie band and a 1980s-era, New York-based “noise rock” band, while the Tri-City Dust Devils are a minor-league baseball team in Pasco, Wash.
“Dancing devil” and “dirt devil” are terms for a dust devil in the Southwest. In Death Valley, Calif., it may be called a “sand auger” or “dust whirl.” To the Navajo, dust devils are chiindii, ghosts or spirits of the dead members of their tribe. Their tradition holds that a chiindii spinning counterclockwise is a bad spirit, while one spinning clockwise is a good spirit. According to Chicano Folklore, dust devils take on a variety of intriguing nomenclature and personification depending on the part of the world in which they’re found. In African folklore, a dust devil is a Num, a shape-shifting demon or sorcerer occupying the body of a human host and drawn to suffering and self-destructive souls unconsciously seeking release from the pain of their lives. No matter their name or where they’re found, dust devils command attention from scientists and casual observers alike. 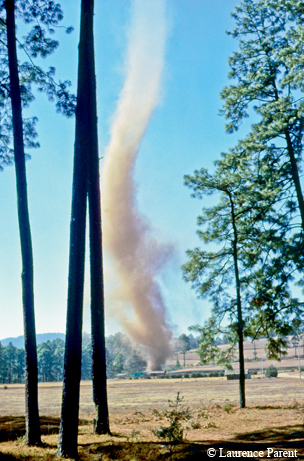 A dust devil springs to life when hot air near the ground rises quickly through a small pocket of cooler, low-pressure air above it, resulting in an unstable situation. Nearby air is drawn into the rising column, causing wind shears that create rotation. The shears and rotation serve as sources of vorticity. As more hot air rushes in at the bottom of the forming vortex, it replaces the air that is rising. Voilà, a dust devil. As the rising air cools, it loses buoyancy. Eventually, surrounding cool air is sucked in, usually dissipating the dust devil in a few seconds. Though most American dust devils are small, measuring several feet wide and roughly the same in height, they can reach up to 300 feet wide and 1,000 feet tall. According to Peterson, unique field studies have measured speeds of more than 60 miles per hour in some dust devils. Mostly ephemeral in nature, some of the larger whirlwinds have been known to spin across the landscape for 10 to 20 minutes. The spinning air column and surface friction produce forward momentum. Ideal conditions for the formation of a devil are clear, sunny skies, light or no wind, a cool atmospheric temperature and flat, barren terrain, such as desert. The greater the difference in temperature between near-surface air and the atmosphere, the longer it will last before dying out. When dust devils become prolific in West Texas during warm-weather months, some motorcyclists choose to leave their bike at home for safer transportation. Though dust devils are typically harmless, history has recorded several instances when they have proved fatal. In 2010, an inflatable jump house in which three children were playing in east El Paso became airborne when a large dust devil picked it up and sent it flying 10 feet in the air and over a fence. The youngsters survived mostly un­scathed, but such was not the case when one of the desert cyclones collapsed a shed near Casper, Wyo., killing a woman. In 2000, a dust devil, packing what was later estimated at 75 mph winds, slammed into the Coconino County Fair­grounds in Flagstaff, Ariz., damaging tents, stands and booths and injuring several people. Dust devils of any size also can produce radio noise and electrical fields as they pick up small spinning dirt and dust particles that collide and become electrically charged. These electrical fields help the vortexes lift materials off the ground and hurl them into the atmosphere, sometimes creating what are called “sand pillars” that spew dust into the air, creating hazy skies. Dust devils are not just an earthly phenomenon. Some NASA scientists have voiced concern that when astronauts do someday land on Mars, they will have to contend with wind-propelled dust and sand. Static electricity generated by that planet’s documented giant dust devils could pose a hazard to rockets launching from the surface to return to Earth. Images sent home by space probes such as the Mars rover Spirit show innumerable wandering tracks all over the planet’s surface left by gyrating extraterrestrial dust devils. For now, however, travelers driving through the vast dry farmlands and deserts of Texas can content themselves with enjoying the show beyond their windshield, knowing they share this phenomenon — dust devils — with earthlings around the globe, and maybe even Martians.